Aston Martin has confirmed Grainger & Worrall (GW) as its preferred engine castings partner for the new DB11. At the heart of this iconic sports car is the new 5.2-litre twin turbocharged V12 gasoline engine. This engine sets even higher performance standards for the latest DB iteration, the cleanest, most fuel efficient, powerful and fastest accelerating model in Aston Martin’s history. Using skills and technology pioneered by GW in its work with F1 teams and other high performance marques, GW has worked closely with Aston Martin’s engineering design team to enable the evolution of a lighter, more powerful power plant. The engine blocks and heads are produced in a dedicated production environment at GW’s UK facility. Exploiting the potential of GW’s precision sand casting process all castings are manufactured from a high grade, high integrity and recyclable aluminum alloy. Assembled at Aston Martin’s state-of-the-art engine plant in Cologne, Germany, the new twin-turbocharged, 48-valve, V12 unit is able to meet stringent emission and fuel consumption requirements, whilst producing increased performance. As part of the extensive engine development process, GW created intricate sand cores and structures using the latest 3D sand printing technology. This supported the complex CAD outputs of the design team, which was responsible for the production and validation of the development parts prior to production. In addition to the ongoing supply of engine castings, GW provides rigorous in-process inspection together with unique part identity, ensuring full product traceability. 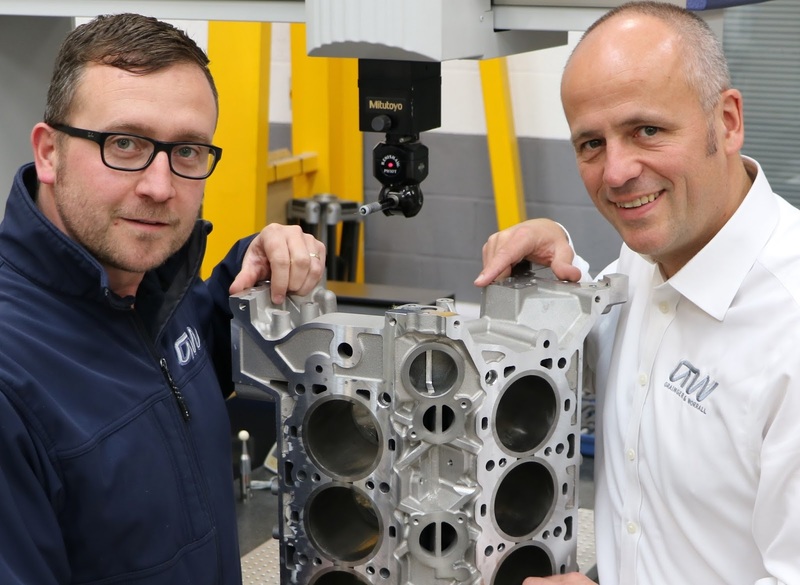 Employing more than 550 people in the UK, with an annual turnover in excess of £50 million, GW supplies world-class, high precision castings to F1 motorsport and prestige marques. The family-owned business is an example of UK innovation success; the company invests significantly in research and development, and exports more than 55% of its products overseas. Of course, G&W is world famous for other castings products, most notably its contribution to the development of both diesel and gasoline engines which use compacted graphite iron (CGO castings for cylinder blocks and heads. Ford Motor Company is one of G&W’s most significant customers. G&W produces the vital prototype components which form a precursor to work by the main CGI foundries round the world, including Tupy SA in Brazil. Edward Grainger takes as a particular interest in CGI prototype work. The confirmation of G&W as supplier of the V12 engine block is hardly surprising, in a way. In September, Grainger & Worrall completed the purchase of the Cosworth castings facility in Worcester. The newly-acquired site, which will be known as GW COSCAST, will see GW expand the scope of its castings operations, allying its pioneering use of digital technology with the COSCAST process, to create high-performance castings for the motorsport, automotive and structural castings markets. It may be recalled that many years ago, John Campbell developed a new casting process which later became known as the ‘Cosworth casting process’ making Worcester as the base for the technology. This new foundry, opened in the late 1970s, was described at the time as a 'precision casting facility' to create an image far removed from original 'dirt floor' foundry images. A feature of the design was the incorporation of an electromagnetic lift pump. The process really gathered momentum following frustration by the highly intelligent Keith Duckworth (one of the founders of Cosworth, the other being Mike Costin) with porosity and cracking in aluminium castings, especially in the context of castings for the Cosworth DFX racing engine. In 1977, Duckworth instigated further research work and out of this a new manufacturing process was born. With the new process, Cosworth Castings, as it became, could produce racing engine blocks and heads. These became available in 1979. The company also went to make cylinder heads for the 16-valve engine in the Mercedes-Benz 190. In the 1980s, Ford Motor Company took out an exclusive license for the process and installed it at its Windsor, Ontario foundry. Job 1 for the foundry was the Spring of 1994. Among components were heads for the 2.5- and 3-litre V6 engines. Ford was one of two licensees: the other was M&R Foundry in South Africa which had a contract to make 100,000 components a year for Toyota. At the same time, a new foundry was planned for Worcester, based on the Windsor design. By the end of 1993 the Worcester foundry had a planned capacity of 75,000 heads a year for Ford Motor Company, Jaguar Cars (AJ26) and Aston Martin. At the time, sources claimed the foundry could make 72 x 34kg V8 cylinder blocks an hour or 190 x 13kg cylinder heads an hour. For many years in the 1980s and 1990s, a cloak of secrecy surrounded the factory as executives sought to keep under wraps what was actually happening in the foundry, who were the customers and the nature of the jobs being produced. Somewhat curiously, a very similar process was evolved by Rover Group which worked in collaboration with Warwick University. This became known as the LPS or low-pressure system. It was, too all intents and purposes, identical to the Cosworth process, with the exception of one feature: the Rover system used silica sand whereas the Cosworth process used zirconia sand. The most famous Rover engine to use castings produced by the LPS process was the K-Series. As the foundry was located within Rover Group very few details of its technology ever surfaced. In its time, Cosworth Castings has had numerous owners. These include UEI, Carton Communications and Vickers plc. Its most recent owner was Mahle Powertrain which acquired the business when it took over Cosworth Engineering in Northampton. Mahle Powertrain has worked in close co-operation with GW to ensure a smooth and mutually beneficial sale. Edward Grainger, photographed above, when asked if the company had supplied prototype cylinder blocks in compacted graphite iron (CGI) for General Motors’ Duramax 4.5-litre V8 and the Ford Motor Company's three-cylinder 1-litre EcoBoost engines, said he could not formally comment on specific work for specific OEMs, due to signed confidentially agreements, but he did add that "CGI continued to be an area of real interest for G&W. Meanwhile, it is known that Next January G&W is about to move all of its machining operations to Bridgnorth from Telford, both are in Shropshire.